Abigail Adams lived the American Revolution as the wife of one of its central figures–John Adams. Her family correspondence, published along with a memoir by her grandson, Charles Francis Adams, brings that era into eloquent focus. What was it like to hear the cannon’s roar from your window? to face pestilence? food shortages? rampant inflation? devalued coinage? to raise four children alone–and earn the money to keep your household afloat, while your husband was engaged in politics and diplomacy miles and oceans away . . . for years at a time? And she enlivened her writing with pithy accounts of Revolutionary doings: July 31, 1777, “You must know that there is a great scarcity of sugar and coffee . . . An eminent, wealthy, stingy merchant had a hogshead of coffee in his store, which he refused to sell . . . under six shillings per pound. A number of females . . . assembled with a cart and trucks, marched down to the warehouse, and demanded the keys, which he refused to deliver. Upon which, one of them seized him by his neck . . .” The women “then opened the warehouse, hoisted out the coffee themselves, put it into the truck and drove off. 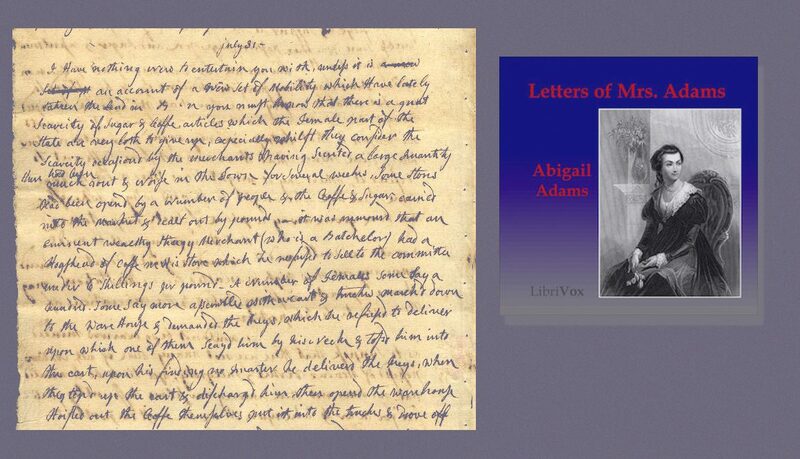 . . A large concourse of men stood amazed, silent spectators of the whole transaction.” Abigail’s letters, letters of “a vigorous mind,” are a fascinating listen. I have also recorded one of John Adams’ letters, dated July 27, 1777, containing a recommended reading list for his 10-year old son John Quincy (Letter 191, on page 284 of the e-text). From the date on the letter, you might guess that I recorded this for the 7th Anniversary of LibriVox.